The Orianne Society’s annual Eastern Indigo Snake survey season is nearing its halfway mark at the turn of the New Year. The autumn-early winter portion of this survey season has included a number of noteworthy discoveries by Orianne Society staff. Ben Stegenga, Orianne Field Technician, got the survey season off to an early start in October by catching a yearling Eastern Indigo Snake as it slithered through a South Georgia wetland. Then Jacob Barrett, Orianne Field Operations Coordinator, found his first-ever Eastern Indigo in the wild. 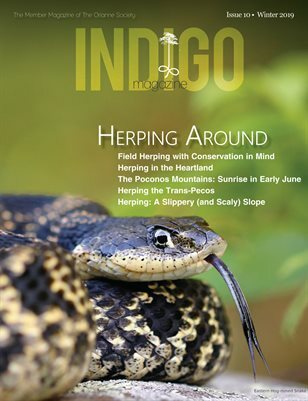 It was a “new snake” (i.e., had not previously been marked) for the Orianne Indigo Snake Preserve. These two pre-season Eastern Indigo encounters brought an air of optimism, suggesting we would find many more once the survey season officially started at the beginning of November. A particularly exciting Eastern Indigo sighting this fall involved finding two 3-month-old juvenile Eastern Indigo Snakes on field surveys. Both of these recent hatchlings were spotted in early December. Such juvenile Indigos are remarkable finds, due to the rarity of encountering young of the year juveniles in the field. Statistically less than 5 percent of Eastern Indigo Snakes in this age class have been encountered in the wild on surveys. For myself, the 2016 Eastern Indigo Snake survey season started off slowly. But I turned it around in December, after much-needed rains ended a protracted drought that seemed to hinder snake surface activity. I encountered three splendid Eastern Indigos—and one of these snakes was a large male I first captured and marked (by PIT tagging) a year ago in December 2015. This impressive male measured 6 feet, 10 inches last December; he had grown 4 inches over the ensuing months to a whopping 7 feet, 1.5 inches when recaptured this December. While conducting Eastern Indigo surveys and Gopher Tortoise occupancy surveys in South Georgia, The Orianne Society staff are also actively looking for Eastern Diamond-backed Rattlesnakes. Eastern Diamond-backed Rattlesnakes, like many other Longleaf Pine ecosystem species, are experiencing population declines throughout much of their South Georgia range. The Orianne Society has been conducting extensive surveys for this snake in Georgia to better understand this iconic viper’s population status. Thus far, we have encountered half a dozen Eastern Diamondbacks this field season. Some of these snakes have had noticeable boluses from recent meals. On a recent sunny and warm December day, I spotted a tiny 2-feet-long juvenile rattler that had just exited a Gopher Tortoise burrow to bask. This snake had a very prominent bulge in its stomach—from a successful ambush of a small rodent. Late fall and winter feeding is not unusual for some species of snakes. However, feeding during the colder months poses some risk because snakes require external sources of warmth for their digestive systems to properly function. If a large meal is consumed just before an unexpected prolonged drop in temperature, it could prove quite harmful or even fatal to the snake if the meal cannot be processed. Several large adult Eastern Diamond-backed Rattlesnakes were found on November and December surveys by myself, Dirk Stevenson and Houston Chandler. I found an exceptionally-large and robust female close to a tortoise burrow that was subsequently swabbed by Houston and Ben in order to test for the presence of Ophidiomyces ophiodiicola, the cause of Snake Fungal Disease. This disturbing and sometimes fatal disease has spread throughout much of the eastern half of the United States and has been detected in numerous species of snakes in Georgia, as well. The Orianne Society staff has had a very promising start to this year’s Eastern Indigo survey season. The large number of target species encountered thus far has been very encouraging. We hope that the latter half of this survey season holds many more encounters with Eastern Indigo Snakes, Eastern Diamond-backed Rattlesnakes and other declining species of reptiles and amphibians native to South Georgia’s beautiful Longleaf Pine ecosystems.